Home » News » General » Our boys. Our Anzacs. North Ryde was a small rural community when war broke out in August 1914. Just as it is now, it had a strong community spirit built through the Progress Association, churches, North Ryde PS and the School of Arts. Families grew up together and knew each other well. 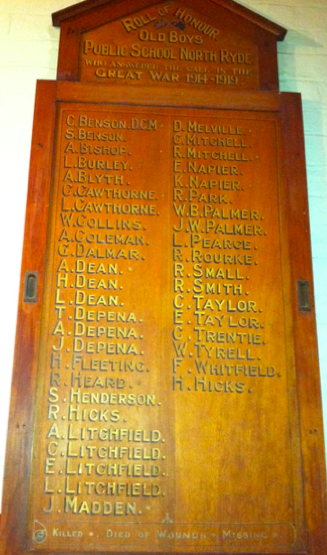 Within the first few months of war several ex-students of North Ryde PS had enlisted. Many were in their early twenties and would have been former classmates. Did they encourage each other to enlist? That we don’t know but we know most were still living in North Ryde at enlistment and that they came from a variety of occupations: labourers, clerks, orchadists, farriers, papermakers, gangers, brick makers, mill hands, shop assistants and lamp inspectors. Forty three ex-NRPS students answered the call, only thirty-three returned. Our most highly decorated was Captain Claude Benson who was awarded a Distinguished Conduct Medal for brave actions at the Gallipoli landing. Our sadest story is perhaps Alexander Depena who returned to spend the rest of his years in Callum Park mental institution. For a small community forty three ex-students who served in the Great War is something of which our current North Ryde PS students can proud.